I number of alert readers pointed out to me that the 1st generationiPod touch doesn't have a microphone connection through the headphonejack, so the only way to get audio into the iPod is to use a microphonethrough the dock connector. Fortunately, the MacallyiVoice III is available, and it seems to work better with Fring ifyou wait until after Fring loads before attaching it to the iPod. From the department of "Computers on TV and in the Movies": I wasable to buy the first two seasons of Angel (a Buffy theVampire Slayer spin-off) for peanuts. Right in the middle ofwatching the second season, I gasped in amazement. 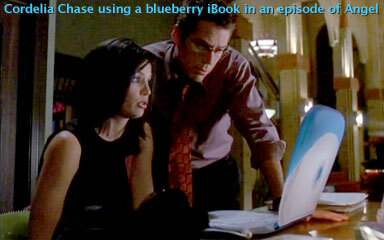 Cordelia Chase(Angel's sidekick and office manager) was using a clamshell iBook. Not just anyclamshell, a gray one. Which means that it is the "Paris" iBook withFireWire. I would love to have one of those! Incidentally, this is why my wife loves me. If I see a pretty girlwith a computer, I lust after the computer. Of course, thirty years ago. . . they didn't make iBooks. I am still in the planning stages of moving the hard drive out ofthe Pismo and swappingit with the hard drive in the G4 iBookthat my daughter bequeathed to me from college. I figure that the firststep will be removing the 60 GB drive from the G4 iBook. This looks like the messy part of the entire process. After the long removalprocedure, the G4 is going to have to sit for a while, in tinypieces, while I clone the contents of the Pismo onto the 60 GB drive ofthe G4. I can remove the 160 GB drive from the Pismo (much easier thanthe removal of the G4's drive) and then install it into the G4. The 60GB goes into the Pismo, and I can reinstall "Leopard" on the G4 withthe 160 GB drive. I also have a 160 GB FireWire drive that I plan touse with Time Machine to back up the G4. This weekend I'm going to "test" the iBook by hooking it up to thesnake's nest of wires that hooks my accessories to my maincomputer. Life is good, but wouldn't it be nice to have a "Paris" clamshell?